Marketed as a high performance freeride/wave kite, the North Fuse 18 meter is the ideal kite for someone looking for a light wind kite, or the heavier rider looking for an affordable inroad to kiteboarding. With a huge wind range, massive boosting ability, and responsive turning speed, the Fuse is sure to impress. 4 years ago we set out to build our first dedicated 4-line kite, the Fuse was born and we have never looked back. 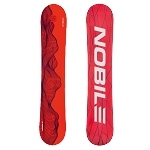 Originally its design was similar to the Rebel with a simple bridled 4-line set up. After four years of continuous development, it has evolved to become a competitive kite in its very own right. 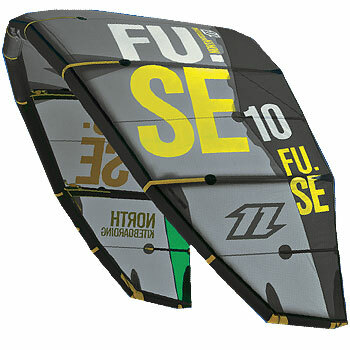 Today the Fuse is an entirely unique kite and the choice of many all round riders looking for a 4 line bridled kite. Of course it can also be ridden in a 5 line set up if wanted! We worked hard to ensure we got the bridle just right on the kite, over the years it has been tweaked and adjusted to get the most out of the kite and the results speak for themselves. The 14, 16 and 18 have some of the lowest wind ranges in our line up and this is largely thanks to the bridle set up allowing the kite to be trimmed to perfection. If you are looking for a kite for really light winds then the 14, 16 and 18m deliver in every aspect. It is a high performance freeride lightwind kite that will impress anyone who rides it. Jumping and hangtime are exceptional excellent and the turning characteristics are responsive and direct. The bridle gives the kite excellent depower and a huge wind range. The upwind performance is impressive. The adaptive tips combined with our unique streamline strut system give the kite much better stability in the air and improve the turning speed and response rate of the kite dramatically. Pump up, hook in and get ready to take off!